Disneyland has a habit of sneaking in buzzworthy, photogenic desserts without anyone anticipating it. Case in point, they just brought back their Dole Whip Donuts following a viral launch earlier this year. Officially known as "Pineapple Meringue Donuts," these treats have been coined by Instagrammers with the above moniker, thanks to their pineapple interior, pineapple glaze, and whipped marshmallow topping that looks like a soft serve swirl. There may not be any actual Dole Whip inside, but that hasn't stopped the sweet from becoming a park favorite FAST. The Dole Whip Donuts left the menu at the Disneyland Donut Cart just prior to Pixar Fest opening. However, Disneyland Instagrammers have talked to cast members who've said the treat will be back for about a month or so. Multiple batches are made throughout the day, so make sure to check back if they're sold out on your first visit. The Disneyland Donut Cart is located right next to the massive Sleeping Beauty Castle, so you can't miss it. Unicorn Cupcake! It's actually called the Iridescent Cupcake, but my daughter is calling it the unicorn cupcake. ?? ???? Available from the Jolly Holiday Bakery and Cafe in Disneyland. ▪ $6.99 AP discount available ? ▪ What do you do after your kid does great at the dentist? You take them to @Disneyland and buy them awesome new cupcakes like this! The cupcake is a Confetti and Passion Fruit Cupcake with Passion Fruit and Mango filling finished with a tri-colored White Chocolate Champagne Mousse. De-lish!!! Disneyland's dessert shakeup doesn't just involve the donut, however. They've also snuck in a unicorn-themed "Iridescent Cupcake" that is tailored to Instagram feeds. From the golden unicorn horn on top, to the tri-colored white chocolate champagne mousse "frosting," everything about this cupcake screams "photogenic." Oh, and it's got a passion fruit and mango filling on the inside for a little surprise as well. 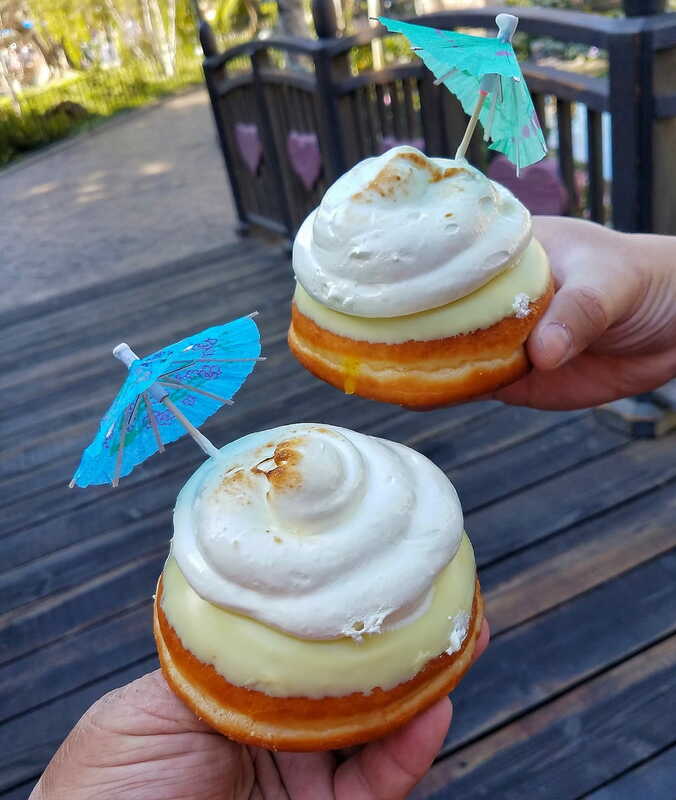 There's no timetable on how long the cupcake will be around, but photos of it and the Dole Whip Donut together are already going nuts on Instagram, and you'll have a month to grab one of them. Featured image by Peter Pham // Foodbeast.